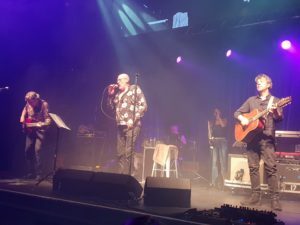 Back in December last year Fish was scheduled to perform at the Assembly in Leamington when huge snowfall caused traffic chaos resulting in many people not getting to the event (even though it did go ahead). It is, therefore, a measure of the man, and the respect he holds his family of fans in, that this gig honoured the tickets of all of those who didn’t make the original show, plus extra tickets released, with the result being a packed venue of expectant devotees looking forward to what is always a live experience to be relished. The show tonight was the third and final UK gig of this leg of the tour presenting both the 30th anniversary of the last studio album Fish recorded with the band Marillion, Clutching At Straws, and some newer works recently released on the EP ‘A Parley With Angels’ (which I will be reviewing later this week.) But the first thing to say is that the new works fit wonderfully with the Clutching material; seemingly looking at similar topics and themes but from rather different perspectives of a man who’d just reached 30 (remarkably it may seem given the subject matter of ‘Torch Song’) and now as he passes his 60th birthday looking towards his nearing retirement. And with the added poignancy of this gig going ahead almost 30 years to the day the announcement was made that Fish was to leave Marillion; a day that broke my 16 year old heart. As for the gig iteself, first mention must be made of the support act of Doris Brendel (not Grendel!) and her band who performed a small half hour set of high energy that set the standard for a hard rocking main act. And what a main act we were treated to. To be honest, I can think of very few better opening songs to a live set than Slainthe Mhath; its always been a song to rise the blood, including the crowd in its exaltation, inciting us almost to sing, bellow and shout along with Fish, at this show it brought the crowd to an early crescendo, a height of adoring devotion, a frenzy of togetherness. And this is the skill of Fish as one of rock’s premier frontmen; once he’s grabbed you, he ain’t going to let go; you have no choice, what he demands we do, whether that be to raise our arms to clap and salute as one, or to hang on his every word as he imparts wisdom, comedy and vitriol in his asides to the assembled throng in between songs, the crowd as one and individually were in the big man’s grasp from Slainthe to Incommunicado and all parts between. Fish is ably supported by what has become a skilful, trusted and respected band, featuring co-writers, guitarist Robin Boult and bassist Steve Vantsis, the returning Foss Paterson on keyboards, drummer Gavin Griffiths and Doris Brendel who adds backing vocals and woodwind accompaniment taking the Clutching material in not necessarily a new direction but one that is reflective and supportive of the main man, as he performs these songs 30 years after their creation. Robin Boult, in particular, takes on the work of the iconic and great guitarist Steve Rotherey brilliantly, developing a balance between being respectful to the original work, whilst making it relevant to his skills as a player and supportive and empathetic to the more mature voice of Fish. And with the way the arrangements fit to the new works of 4 songs included in this set, the show was a blinding set of an epic standard that left the crowd delighted by the performance they witnessed. 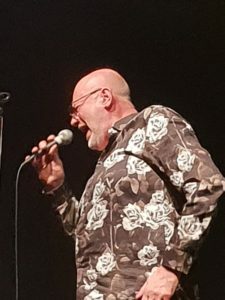 This gig saw an artist confident in the music they showcased, and with that came an honesty, an enjoyment and a passion that was infectious and a delight to be part of. Fish and the band now make their way around Northern and Eastern Europe for October and November before returning to play venues in the UK in December. Visit Fish’s website here http://fishmusic.scot/live-fish/ for tickets – you will not be disappointed.